A compact thermal printer with the ultimate in user-friendliness. 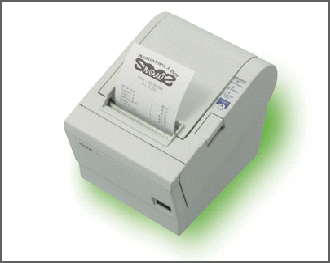 Beautiful and compact, this fast thermal printer delivers print at speeds up to 150mm/sec. The TM-T88III employs a drop-in roll-paper loading system that makes paper replacement fast and easy. It also features thoughtful design elements that make head cleaning and other maintenance tasks a breeze. In addition, a black case allows you to choose the look that best fits your shop.